Building work is underway to repair the glass. Nottinghamshire Police are investigating after a car was used to ram raid a Mansfield shop. 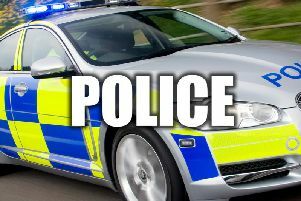 At around 12.30am this morning, August 28, a number of unknown offenders wearing balaclavas are believed to have placed wooden ramps in front of the main entrance of Currys PC World on Nottingham Road, and driven a red Renault Megane through the doors. Photo sent in from reader Rhys Hughes. They are believed to have made off from the scene in a black car. Officers are working to establish what was stolen. A cordon remains in place while detectives gather evidence and the car remains in the store while the building is made structurally safe. Currys PC World has been contacted for a comment, but is yet to respond. The shop remains closed to customers today. The car from the raid remains inside the building until it is structurally safe.